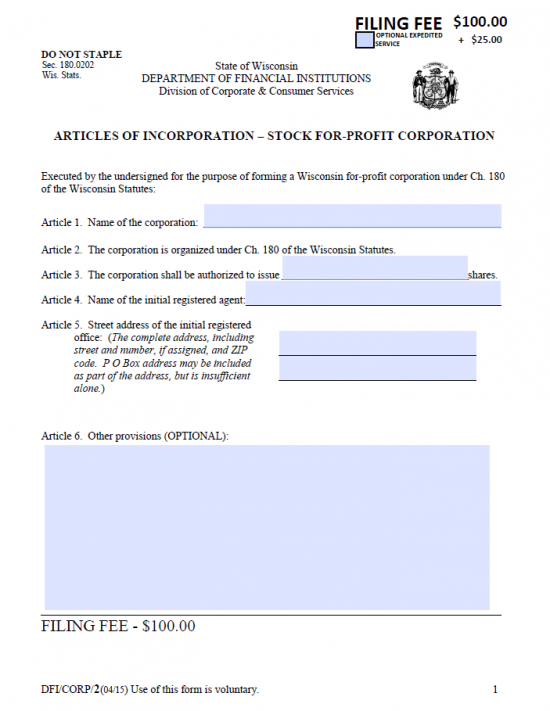 The Wisconsin Articles of Incorporation – Stock For Profit Corporation | Form DFI Corp 2 must be submitted to the State of Wisconsin Department of Financial Institutions when an Incorporator wishes to form a corporation in this state. The State of Wisconsin will require several pieces of information to be reported regarding the incorporation of an entity. For instance, the Name of the corporation being formed, the Identity of the Registered Agent, and the Total Number of Authorized Shares must all be solidified by the time an entity forms and thus, must be documented. The information on this template form is a basic guideline to a straightforward formation of a corporation however some entities may be required to report more information. In such a case, you may need to draw up your own articles for submission. That is, while these articles will take care of the majority of entities, none are required to use this form to submit this information if a different document is drawn up so long as all of the information required by this template is present. You may submit this form either by Mail or Express Mail. If you wish, you may also file online. The Filing Fee of $100.00 will be required regardless of the method of submission. If you are submitting by mail, you will need to remit payment with a check made out to “Department of Financial Institutions” while, if filing online, you will need to pay with a credit card. On the whole, reviewing and processing this paperwork will take roughly five business days (from receipt) however this may be expedited to the close of the next business day so long as you submit payment of the $25.00 Expedited Service Fee. Step 1 - Download the Wisconsin Articles of Incorporation – Stock For-Profit Corporation by selecting “Download Form” above or by clicking here: Form DFI Corp 2. This is a PDF document, so you will need a PDF programming program or a browser capable of filling out PDF forms to enter information on screen. Otherwise you may print it then fill it out. If printing, keep in mind that you must use Black Ink. Step 2 - The first item, Article 1, requires the Full Name of the corporation on the space provided. Make sure to use a word of incorporation as required by the State of Wisconsin. For the purposes of the entity being formed you must use corporate designators such as Corporation, Incorporated, Corp., Inc., etc. Step 3 - Article 2 will name Chapter 180 of the Wisconsin Statutes as the basis for the regulations named in this document. 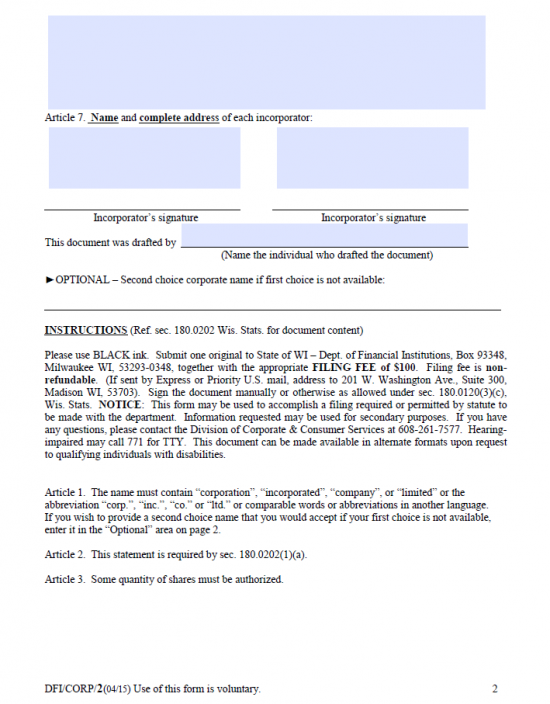 Signing this document will verify the submitter and entity being represented by the submitter will abide by Chapter 180 of the Wisconsin Statutes. Step 4 - In Article 3 you will be required to report the Total Number of Shares this corporation has been authorized to issue. Step 5 - Document the Full Name of the Wisconsin Registered Agent in the space allotted in Article 4. 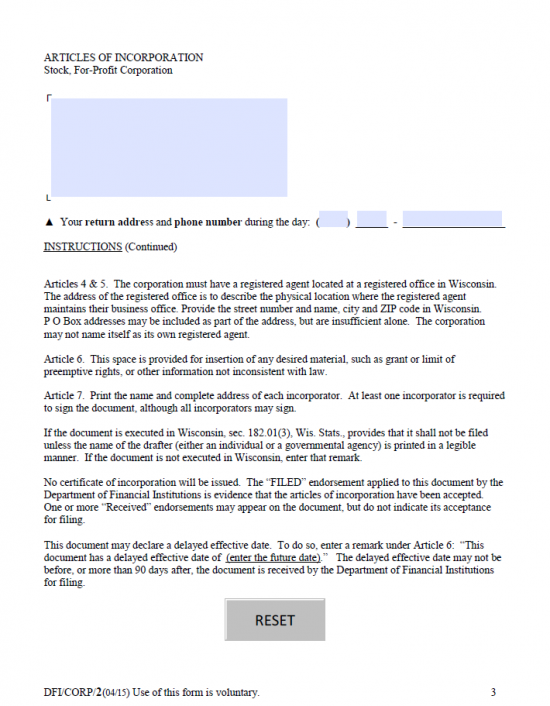 Step 6 - In Article 5, use the spaces provided to enter the Full Address of the Wisconsin Registered Office where the Wisconsin Registered Agent will receive Service of Process on behalf of the forming corporation should the need arise. Step 8 - Article 7 must bear the Full Name and Full Address of each Incorporator. Document this information in the two boxes provided. Step 9 - Finally at least one Incorporator must Sign this document on the line labeled “Incorporator’s Signature.” Note: This document may be signed by any and all Incorporators however, the Signing Party must be listed in Article 7. Step 10 - Next, enter the Name of the individual who has completed the Wisconsin Articles of Incorporation. Step 11 - Below the Submitter’s Name, you have the option of Naming an alternative name should the Name you have reported in Article 1 be unavailable. Step 12 - On page three, locate the blank box in the top left hand corner. Here, you must enter the Name and Mailing Address you wish a response or corresponding regarding these articles to be mailed. Below this will be a space for the Daytime Area Code and Phone Number where a Contact Person may be reached in the event the Wisconsin Department of Financial Institutions requires clarification on any issues. Step 13 - Make sure to review all the information that has been reported in this document as it must be correct. When you are ready, mail one original completed Wisconsin Articles of Incorporation and a check covering the Filing Fee ($100.00) and payable to “Department of Financial Institutions.” If you wish to Expedite the review of these articles, mark the check box in the upper right hand corner then include an additional payment of $25.00. 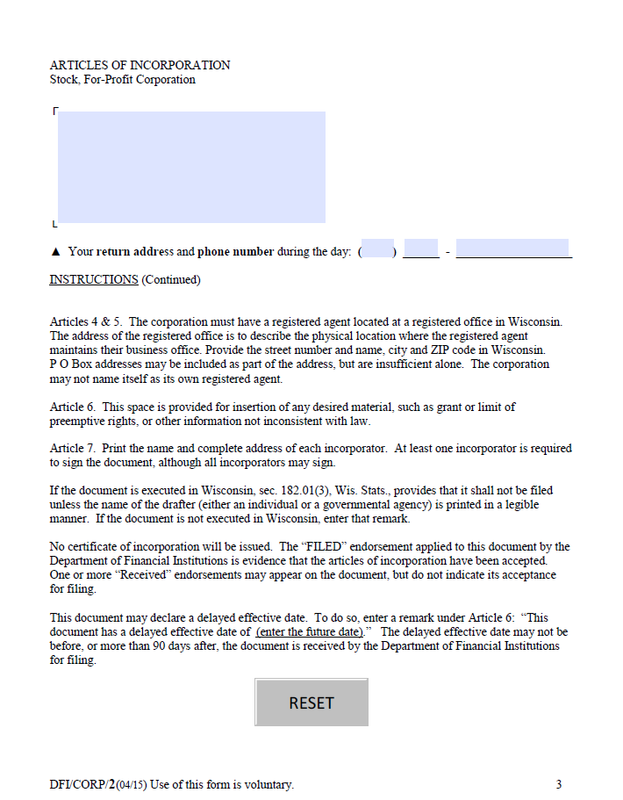 Step 1 - Go to the Wisconsin Department of Financial Institutions Online Articles of Incorporation page here: https://www.wdfi.org/apps/corpformation. Select the first link: Business Corporation – Wisconsin Stock For Profit Corporation. Step 3 - Read the paragraph regarding naming your corporation at the top of the page. Once you are ready, enter the Full Name of the corporation being formed as it should appear on the record books in the text field labeled “Name of Corporation.” Remember this must contain an appropriate word of incorporation such as “Corporation,” “Incorporated,” “Corp.,” or “Inc.” When ready, select the button labeled “Next.” Note: This is the first article. The second article is a binding statement just below the text box. Step 5 - This next page will contain information requested for Article 5. If the Authorized Stock of the forming corporation is divided into Classes then you must report on all the Classes of Shares. In the first text field, enter the Number of Shares Authorized for a particular Class of Stock. Then in the text box labeled “Class,” select “Common” or “Preferred.” Report the Series of the Shares being entered in the third text field. Finally, in the fourth text field, report the Par Value Per Share for the Class you are reporting. When you are done with an entry, either select “Save Stock” or “Save & Add Another.” This will display the Stock you have reported on. You may view it (in case you need to edit or delete the information) by selecting the button labeled “Back to Stock.” This will display all the stock information you have entered. Note: It Stock you are reporting has no par value, then select the button box labeled “No Par Value.” When you are ready, select the “Next” button from the Back to Stock Page. Step 6 - The next page will concern itself with Article 6. This is where each Incorporator must be reported. In the top half of the page, enter the First Name, Middle Name, Last Name, and Suffix of an Incorporator. If the Incorporator being reported is a business, then only enter the Name of this business in the text field labeled “Entity Name.” Then, in the Incorporator Address section, report the Full Business Address of the Incorporator being named using the available fields (Address 1 and 2, City, State/Province, Zip Code, and Country). If the Incorporator is in another country use the “if other, specify” field to report any missing information. When you are done, either select the button labeled “Save Incorporator” or “Save & Add Another.” Once, you select “Save Incorporator” it will display the current entries thus, giving the opportunity to Edit an entry, Delete an entry, or proceed to the next section. To move to the next section, select the button labeled “Next.” Note: You have the option of using the drop down list at the top of the page to auto populate the fields with the Registered Agent’s information. Step 10 - Next, you must provide a Contact Person for the Wisconsin Department of Financial Institutions. 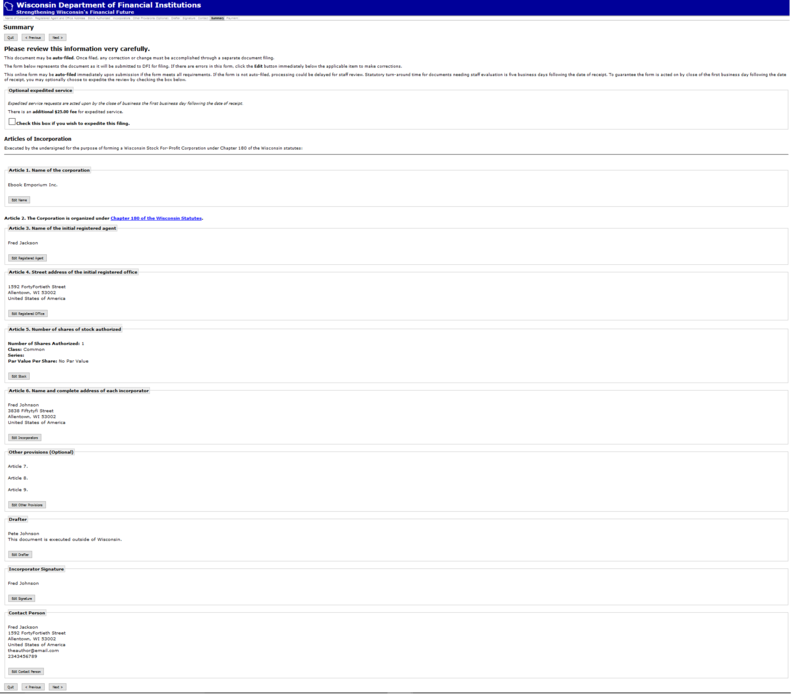 This may be auto populated with one of the parties in the drop down list at the top of the page. The page will consist of a section for the Name (Contact Name), Address (Contact Address), Contact Email (Note: enter the exact same Address in both the fields provided), and a section for the Contact’s Daytime Phone (Contact Phone Number). 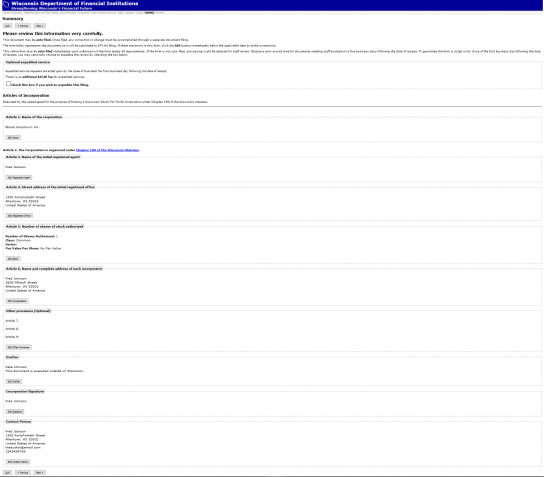 Step 11 - This page will give you an opportunity to review all the information you have entered in one place. If there are any sections that need to be corrected, navigate to the “Edit” button in that section and select it. This will direct the browser to the appropriate area. When you are ready select the button labeled “Next.” This will direct you to the payment area where you may enter the Credit Card information to submit a payment for the $100.00 Filing Fee.